Before you can run out and start buying your next katana to add to your arsenal we must first discuss what size you need by running through a few simple methodologies on how to size a katana. We also need to go over the various parts of the katana so you can identify each properly. To become proficient in using the sword we need to first understand our weapon from the top down. This is important when looking for the optimal katana since it will help you better understand the sword descriptions and what each component is made from. The nice thing about katanas is that though the parts all have the same name, there can be a wide variation of material used to create them or just in the general aesthetics of the parts. For example the tsuba alone could come in brass, steel, silver, or gold and can have an infinite number of designs on it. The tsuka most commonly comes in a leather or nylon wrap but can also come in more unique materials. The metal itself as we learned in the previous step can come in various steels and forging methods. 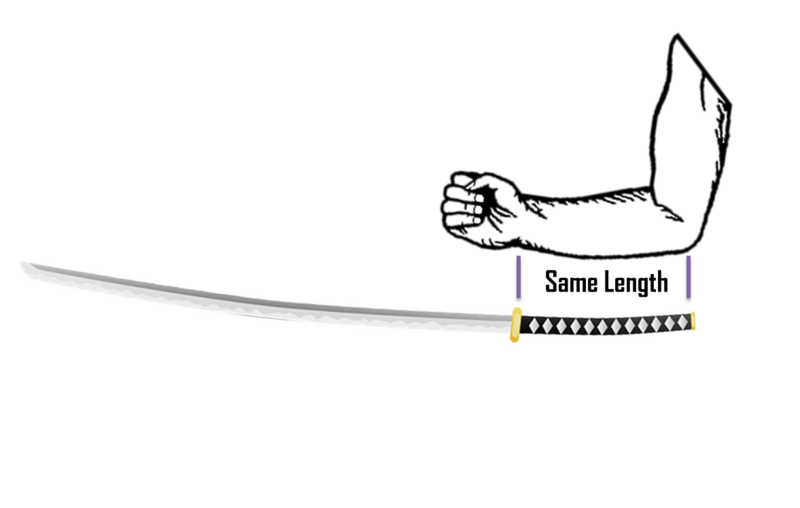 I made the image below to help you identify the various parts of the katana. Now other samurai swords such as the Tanto, Iaito, or Wakizashi will have slightly different components as well and vary in their size and use. 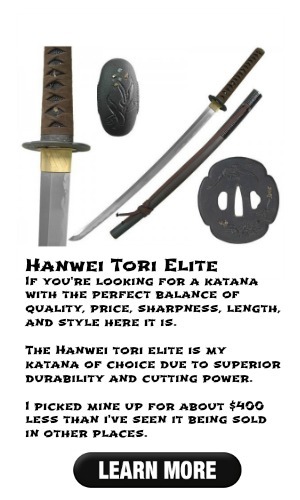 If you are looking at any katanas that have plastic for any of these components DO NOT buy them. These are either cheap imitators or solely are used as novelty props or Halloween costumes. Why is sizing so important? Well if you enjoy having all of your body parts and intend to keep them then yea it’s kind of important. If you try performing any martial arts with a katana that is too large for you you then run the risk of misjudging your distance from the target, or yourself with the blade which could result in an accidental slash. I strongly advise talking with your sensei to get the proper length before buying. However, if you do not have a sensei to go to for advice on these highly specialized weapons, or are just looking for some loose sizing recommendations I can give you the sizing guide that my friends and I go by. You could also seek advice from various online forums (or in our forum here as well) to get feedback on how to size a katana. Again, as a little disclaimer remember to use these weapons at your own discretion since they can be very dangerous and anyone using a katana should have the proper training before doing so. The best way to measure yourself for a blade in my opinion is the tsuka-to-arm-length ratio. This method involves using the length of your forearm to get an idea of how long the tsuka should be. To do this you’ll just need a simple measuring tool. Get out a tape measure or ruler and measure the length of your forearm. So from your elbow to your wrist; this distance is how long the tsuka should also be. It is ok if it isn’t the exact length but I usually do prefer it to be within plus or minus an inch. Most katanas will have an 11″ tsuka, so unless you are either very short or very tall you most likely would go with an 11″. Another method that I’ve seen some use is the hand measurement technique. This is where you place your hands down flat on the table side by side so that they are touching, make sure the fingers are closed (as in the image below), then measure the width of them combined (from the left side of the left hand to the right side of the right hand). Whatever the width is you would then add 3″-4″ to this measurement to provide you with some room on the tsuka. There are a ton of forums out there with numerous sizing information so it’s difficult to go with a one size fits all approach, which again is why I suggest talking with a sensei first. Factors that can influence the exact nagasa (blade length) you need are: skill level, height, and use (iaido, kendo, etc.). 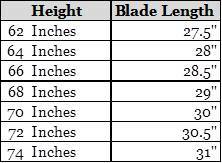 In terms of the most common height to nagasa ratio, please reference the table below I made for you. If you can’t seem to find something that fits you perfect it’s always safer to go on the shorter end than the longer. These blades will be lighter and quicker to draw. By going with a shorter blade you also reduce the risk of inaccurate depth perception. This is when you assume a target is further away than it actually is from your sword which could result in accidental slashing. Let’s avoid that situation. Great, now that we’ve got the first two steps in the Katana Readiness Guide out of the way (these are usually the lesser ‘fun’ parts of the process) we can move on to the fun part, choosing a katana. Since there are so many variations of katanas out there I’ll help you focus your search with a few katanas I believe are good quality. You are by no means limited to these swords but they can help you find a starting point for what you may like, so lets get into my katana reviews! Half way down this page is another great katana breakdown.